The Grasshopper Sparrow is a widespread species found in grassland habitat throughout much of North America. A denizen of open grasslands of intermediate height and density, this species is a good example of a Common Bird in Steep Decline. Rangewide, the Grasshopper Sparrow has lost 68% of its population since 1970, largely due to habitat loss, fragmentation and degradation. Eastern populations have declined even more steeply, disappearing along with historic coastal prairie habitats, and the Florida subspecies is critically endangered. The U.S. Fish and Wildlife Service designated it as a focal species and it is listed as a species of special concern or greatest conservation need in 35 U.S. states. Across its large breeding distribution, Grasshopper Sparrows are often locally distributed in a wide variety of native and managed grassland habitats, with the largest populations in the Midwestern prairies. Eastern birds inhabit remnant coastal prairie, as well as un-mowed hayfields and pastures, reclaimed mines and landfills, and airports. In the West, this species breeds in shortgrass prairie, shrub steppe grasslands in the Great Basin, and semi-desert grasslands of the southwestern U.S. and northern Mexico. Western Grasshopper Sparrows winter primarily in the Chihuahuan grasslands of Mexico, whereas many Eastern birds migrate to the Caribbean and Central America, where local resident populations also occur. COSEWIC 2013. 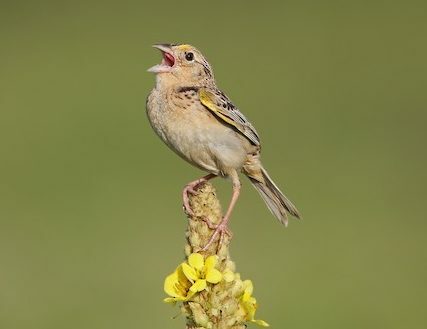 COSEWIC Assessment and Status Report on the Grasshopper Sparrow praetensis subspecies Ammadromus savannarum praetensis in Canada, prepared with the financial support of Environment Canada. Gorzo et al. 2016. Using the North American Breeding Bird Survey to assess broad-scale response of the continent’s most imperiled avian community, grassland birds, to weather variability. West et al. 2016. Grasslands bird occupancy of native warm-season grass. Buxton and Benson 2016. 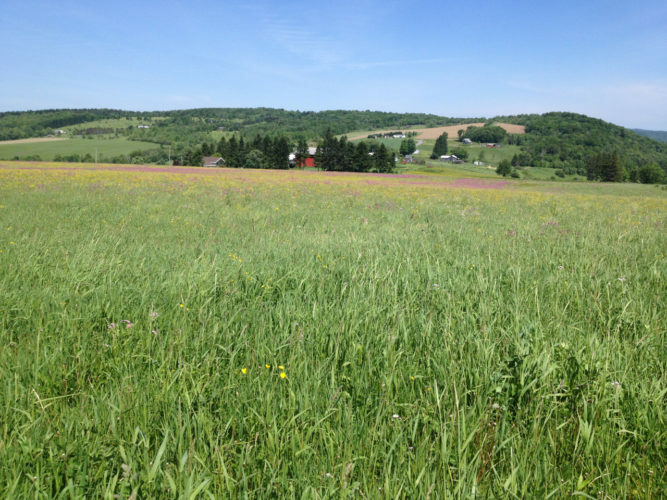 Conservation-priority grassland bird response to urban landcover and habitat fragmentation. Wood and Ammer 2015. Grasshopper Sparrow reproductive success and habitat use on reclaimed surface mines varies by age of reclamation. Augustine and Derner 2015. Patch-burn management, vegetation heterogeneity, and avian response in a semi-arid grassland.